MIT economist Daron Acemoglu and political scientists Richard Nielsen and Charles Stewart III have been named to the 2017 class of Andrew Carnegie Fellows, a prestigious honor supporting research in the social sciences and humanities. The MIT trio is among 35 scholars and intellectuals receiving the fellowships, which are awarded by the Carnegie Corporation of New York. Each fellow receives up to $200,000 to support a research sabbatical. Acemoglu, Nielsen, and Stewart are each pursuing long-term scholarly projects relating to political institutions, authority, and legitimacy. The three scholars discussed the nature of their ongoing research with MIT News, and shared their reactions to receiving the Carnegie fellowships. Acemoglu, the Elizabeth and James Killian Professor of Economics at MIT, has risen to prominence for studying a wide range of issues, from labor economics to the network effects that can cascasde through economies. His best-known work examines the relationship between political institutions and economic growth. Working with a variety of colleagues, including James Robinson of Harvard University and Simon Johnson of the MIT Sloan School of Management, Acemoglu has assembled considerable empirical evidence that the development of government institutions and rights for individuals has encouraged economic activity over the last several centuries. Acemoglu’s ongoing work, backed by the Carnegie fellowship, will continue exploring the relationship between the capacity of states and economic growth. He is currently engaging in more granular studies of state institutions, although still with a wide geographic scope, ranging from the Americas to Africa and Europe. Acemoglu says he feels “completely honored” by the fellowship. “I just hope I can live up to it,” he adds. He has also won the John Bates Clark Medal, the Nemmers Prize in Economics, and the BBVA Foundation Frontiers of Knowledge Award; and been elected to the National Academy of Sciences. 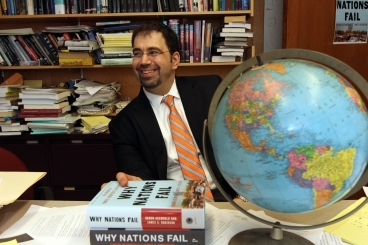 Acemoglu was nominated for the fellowship by the National Bureau of Economic Research, where he is a research associate.